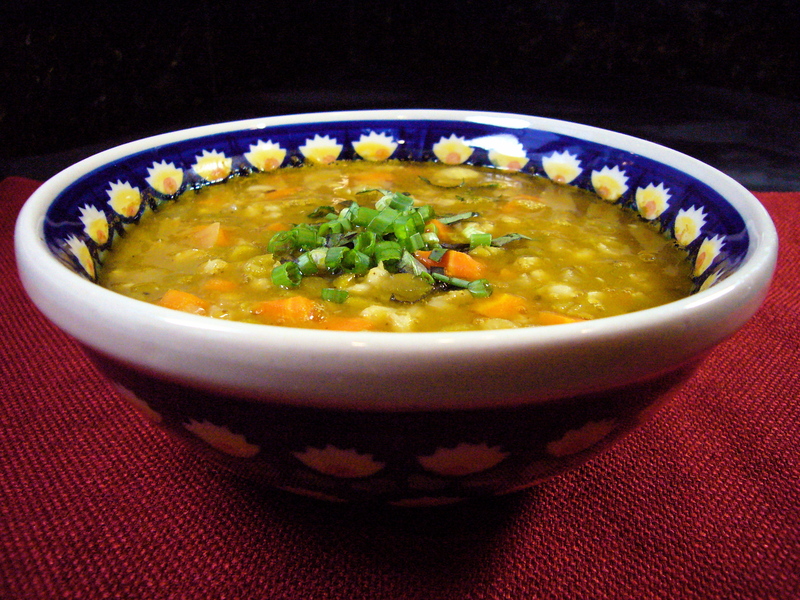 Putting the Health Back in Healthy Soup: Pea and Barley Soup | What about this? Are you feeling like you overate yesterday? Holiday meals have a way of making us eat twice as much food as usual. That’s exactly how I’m feeling, so tonight I’m yearning for something hearty, yet healthy. I decided to try making California Pizza Kitchen’s Dakota Smashed Pea and Barley Soup. The thick texture and savory flavor of this soup are reasons why I order this soup whenever I dine at CPK restaurants during the cooler months. The article lists the sodium levels of favorite menu items at popular restaurants. Lists like these are good for us to read because of the shock value associated with learning that some of our favorite “healthy” foods are really laden with sodium. According to CPK’s website a bowl of Dakota Smashed Pea and Barley Soup has 368 calories, 26 grams of fiber, and 0 grams of saturated fat. That’s not too bad. Here’s the kicker, though, it has 2100 milligrams of sodium! Another CPK favorite Miso Salad – has a whopping 2654 milligrams of sodium for a full serving and 1346 milligrams for a half serving! Recommended sodium levels for most people are less than 1,500 milgrams per day! When trying the Dakota Smashed Pea and Barley Soup recipe at home, I attempted to eliminate some of the sodium by enhancing the flavor as much as possible by using the freshest and most flavorful ingredients possible. I used organic carrots (the leaves still attached), thyme from my herb garden, and in lieu of water I used two cartons of low sodium organic vegetable broth. I went with the low sodium broth because I figured I could always add salt as needed, but couldn’t take it away once it’s been put in the pot! I also added more onion, celery, and cumin than was called for in the recipe. In a large pot combine the split peas, barley, broth, bay leaves, salt, soy sauce, thyme, garlic, sage, and cumin. Bring to a boil over high heat. Reduce the heat to a bare simmer, cover, and cook for one hour, stirring occasionally. Stir in the carrots, onion, and celery. Cover and simmer until the vegetables are tender, about 30 – 40 minutes more. Discard bay leaves. If you do not like your soup chunky, you can remove a third of it and puree small batches of it in a blender and then add it back to the soup pot or you can use an immersion blender to puree some of it while it’s still in the pot. Ladle into warmed soup bowls and garnish with green onions.